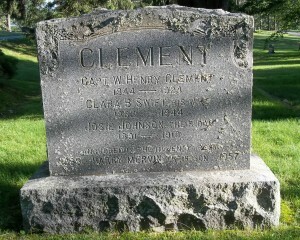 Died: June 5, 1924 in Bourne Ma. at 82 yrs, 4 mos, 7 d.
1. Ezra J. Clement; (September 4, 1863 – ? ); Ezra was an iron moulder in 1980. 2. 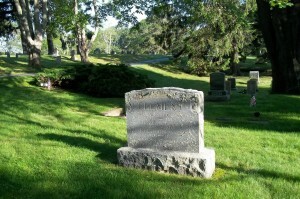 Rodolph Clement; (November 30, 1865 – February 9, 1867); Rodolph is buried with his mother in Pocasset Cemetery. 3. William Tisdale Clement; (December 18, 1872 – December 11, 1957); Married Elizabeth Jane Dunphy (1877 – 1961) (James Dunphy & Catherine M. Sullivan) in Boston Ma. on June 26, 1909; William T. & Elizabeth are buried in Cataumet Cemetery. 4. Nellie M. Clement Taber; (1873 – August 25, 1896); Married James Humphrey Taber (1865 – ?) (Humphrey Smith Taber & Elizabeth Teed Murray) in Acushnet Ma. on November 5, 1890; James married (2) Lillian Eccleston (Abt.1877 – ?) (Lawrence Eccleston & Eliza Worthington) in New Bedford Ma. on July 12, 1900. 1. Florence Mertle Clement McLane; (November 1, 1885 – 1977); Married Elisha F. McLane (Abt.1884 – ?) (Albert C. McLane & Katherine E. Studley) in Cataumet Ma. on April 5, 1915; Florence & her daughter Dorothy Inez McLane are buried in Cataumet Cemetery. 2. Inez Newton Clement Robbins Gardner; (August 11, 1887 – August 1973); Married (1) Charles Allan Robbins (1884 – 1951) (Alfred J. Robbins & Eliza Ann Whitney) in Somerville Ma. on July 20, 1905; They divorced; Inez married (2) Chester Pierce Gardner (1886 – 1963) (George Frederick Gardner & Alice Smith Wellington) in Cataumet Ma. on May 9, 1915; Inez, Chester & her son Ernest Kellogg Robbins are buried in Cataumet Cemetery. 3. Harry Mervin Clement; (February 6, 1889 – August 15, 1957); Harry died at 68 yrs, 6 mos, 13 d. & is buried in Cataumet Cemetery. 4. Josie Johnson Clement; (August 26, 1891 – October 17, 1910); Josie died at 19 yrs, 1 mo, 21 d. & is buried in Cataumet Cemetery.